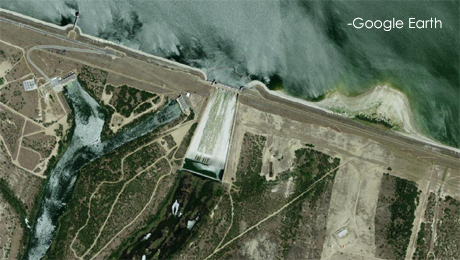 The International Boundary and Water Commission, United States and Mexico, will increase releases from Falcon Dam, located at Falcon Heights, Texas-Nueva Ciudad Guerrero, Tamaulipas, from 8800 cubic feet per second (250 cubic meters per second) to 11,500 cubic feet per second (325 cubic meters per second) on the morning of September 22. The reservoir has continued to rise due to precipitation in the Rio Grande basin, requiring increased releases so as to maintain Falcon Reservoir at a safe level during the hurricane season. Nonetheless, releases remain well below peak releases of 60,000 cubic feet per second (1700 cubic meters per second) that occurred in July. Coupled with inflows from Mexican tributaries downstream from Falcon Dam – the Alamo River, which flows into the Rio Grande near Ciudad Mier, Tamaulipas, and the San Juan River, which flows into the Rio Grande near Rio Grande City, Texas-Ciudad Camargo, Tamaulipas, Rio Grande flow may reach a level requiring diversion of floodwaters into the U.S. interior floodway system in Hidalgo, Cameron, and Willacy Counties later this week. Based on information currently available, any diversions into the U.S. interior floodway would likely be minimal. The interior floodway system includes the Banker Floodway, Main Floodway, North Floodway, and Arroyo Colorado. Diversion of water into the U.S.and Mexican interior floodways in conformance with longstanding international agreements allows the Commission to limit Rio Grande flood conditions at Brownsville, Texas-Matamoros, Tamaulipas. The International Boundary and Water Commission continues to evaluate evolving conditions in the Rio Grande Basin and may increase dam releases in the coming days as conditions warrant. The Commission will notify the public of any future increases. Residents in the affected region who are concerned about flood conditions should monitor National Weather Service warnings and forecasts for information about any flood watches, warnings, and advisories that could be issued for the Rio Grande or local communities.